Carol Jeneid gracefully passed May 8, 2016. However her beautiful art lives on as well as her spirit. Her three children, Heidi, Jon and Devin are honoring her work as an artist and will be presenting her last art show at the Art League September 12th thru the 16 th. Some of her art will be for sale. Her art depicts the dynamic and delightful person she was. Carol moved to Santa Cruz in 1963. Living in Santa Cruz, her life took a 180 degree turn from her upbringing in Long Beach and being crowned Ms. Cotton. She threw away the bras, abandoned the high heals and opted for a life of organic food, colorful community and living a life that celebrated the simple pleasures. 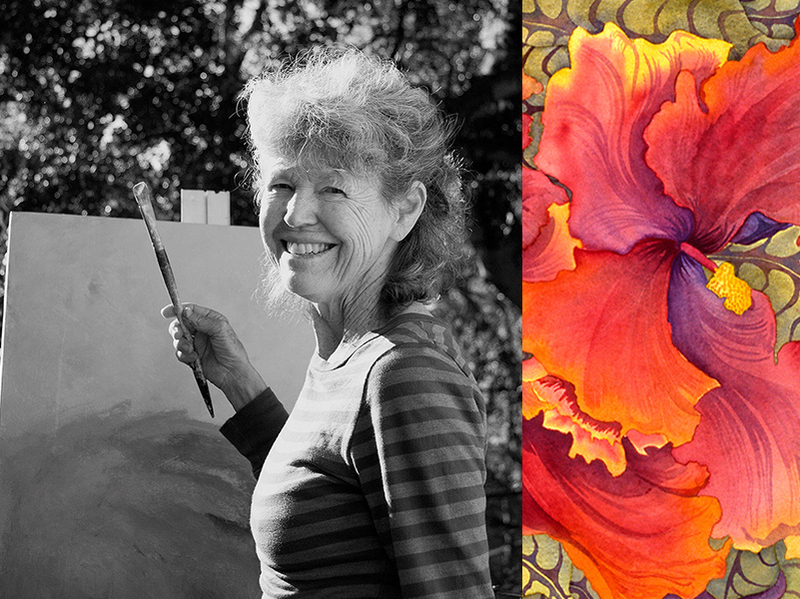 Carol was a combination of a self-taught artist as well as taking local formal art classes and workshops. Her first formal venture was a Life drawing class that she took with her son Devin. This was pivotal to the future of her art. She liked to be daring, try new techniques and mediums. Her art was her life and her life was her art. She saw life as an adventure, to be lived fully and kindly. Her home was the hub for visitors stopping in for a cup of tea, a meal or just a visit. Being with carol was fun, playful, insightful, heart felt and just felt down right good. Carol both worked and volunteered at the Art League for years. Please come celebrate this memorial show honoring Carol Jeneid.